AUCKLAND, 29 SEPTEMBER 2016: IDC's recently published New Zealand Device Landscape study, was based on data contained in IDC's 2016 ConsumerScape 360º survey, which included 1,502 New Zealand respondents. Despite smart watches and fitness wearables adoption growing year on year, the findings suggest New Zealand consumers may already be over the initial hype of these devices. The study revealed that in New Zealand although wearable fitness device adoption at 11% is now higher than the worldwide average, smart watch adoption is less than half the average rate in 2016. “Fitness wearables are resonating well with New Zealand consumers in part because New Zealand is a sporting nation at heart, and these devices are able to improve the users tracking capabilities. As a result, New Zealand fitness wearable adoption lifted from 9%, in 2015, to 11% adoption in 2016. “In contrast, when you look at the adoption of more "one size fits all" style smartwatches, adoption rates are lagging. New Zealand smartwatch acceptance was flat year on year, only achieving 3% adoption in the New Zealand market in 2016. 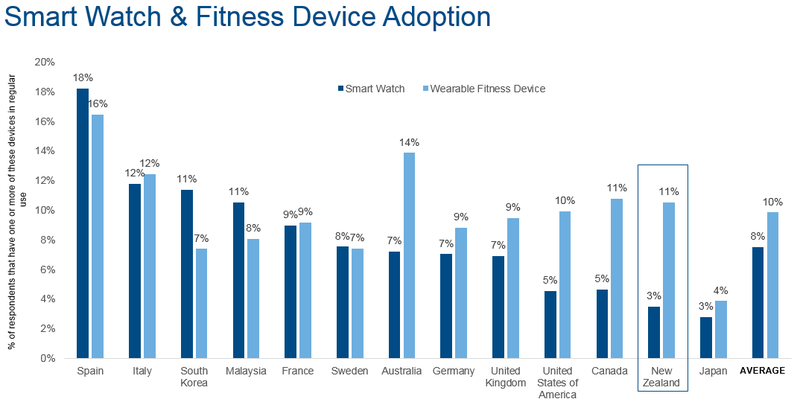 For the same countries displayed in the graph below, average smartwatch adoption is 8%,” says Gorton. In the longer term only 13% of New Zealand consumers expect to purchase a wearable in the future, and this is already impacting shipment numbers. Across Australia and New Zealand wearable shipments declined 15% in the first 6 months of 2016, compared to the same period in 2015. This suggests that unlike other countries, New Zealand consumers are quite pragmatic about the technology and not at all caught up in the hype of wearables. Although consumers value the ability to monitor health aspects in real time, use map/GPS functions, and send SOS messages etc, a greater ROI will be achieved by purchasing devices specific to their individual needs. For this reason, until the price of smartwatches falls significantly it will be specific purpose wearables that drive adoption rates. IDC ConsumerScape 360° is an annual survey of 26 countries and over 50,000 respondents. The survey was conducted in April/May this year and surveyed 1,500 New Zealand consumers. The survey focus is on consumer electronics adoption and digital services. In order to qualify for the survey respondents must be aged 18 or older, not employed in market research advertising, electronics, high tech or IT and must own at least one of a TV, PC, mobile phone or tablet device. Utilising this survey data IDC releases a number of reports focusing on the transformation of the New Zealand consumer over the last number of years and how it compares to other countries surveyed.